This Weekâ€™s Rare Bit Oâ€™Swag: Real men ride pink. 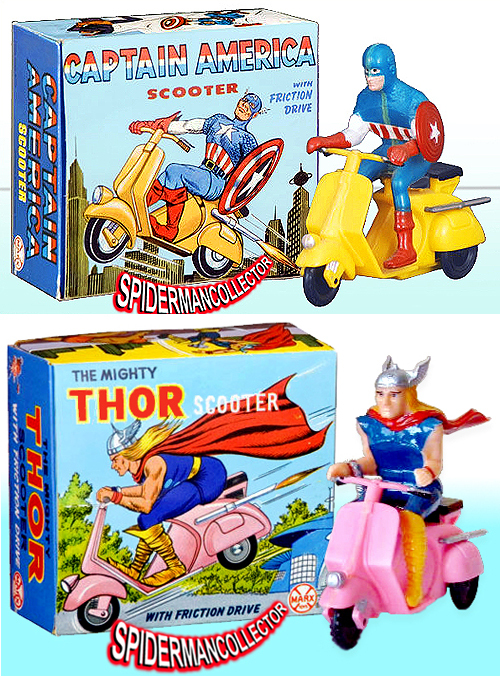 Awhile back we posted about a pink Spiderman scooter Marx toy from 1968 and here are two more Marvel superheroes who are also man enough to make bold color choices. And thanks to Sy over at spidermancollector.net for the photo. This entry was posted in Models, Figurines, Toys and tagged marvel comics, marx, scooter, vespa by Tracy. Bookmark the permalink.